ATHD decked out for the holidays. The American Tobacco Factory in Durham was once part of the city's booming tobacco industry. Now renovated, American Tobacco is a registered historic site that is a cornerstone in Durham's downtown arts and entertainment community. Teamed with the nearby Durham Performing Arts Center and the Durham Bulls baseball stadium, American Tobacco scores a grand slam with entertainment, art exhibits, baseball, and trendy dining in a relaxed setting. Once one of the largest tobacco companies in the world, the American Tobacco Factory, established in the 1800’s, was founded by Washington Duke and his sons. One in particular, James Buchanan Duke, was instrumental in growing the business. The prosperous Duke family gave back to the community, most notably when James Buchanan brought Trinity College to Durham. Their continued generosity made Trinity the largest endowed college in the southeast, in 1924 it was renamed for the family. Duke University’s beautiful campus is minutes away from the American Tobacco District and worth the short drive to visit while in Durham. 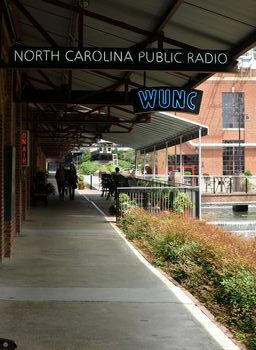 North Carolina’s nationally recognized public radio station, WUNC, has a studio at American Tobacco, broadcasting popular programs The State of Things and The People’s Pharmacy live from that location. From May to October, the American Tobacco Campus and North Carolina Public Radio present the popular Music on the Lawn series of free evening concerts open to the public. Nearby attractions are the Durham Bulls baseball stadium, the Durham Performing Arts Center (DPAC), historic Brightleaf Square, the Carolina Theater, downtown Durham, Duke University, and for nature lovers, the American Tobacco Trail, a 22 mile rails-to-trails project. 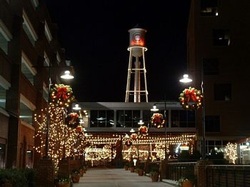 The American Tobacco Historic District is easy to reach from I-40, I-85, I-540, or the 15/501 bypass. It is wheelchair accessible with parking in the large garage or on street (be sure you’re in a parking zone before leaving your car if you find space on the street). Durham’s Rail Station is within walking distance to many sites in this area so taking the train in is also an option.